Zeneidas Surf Garden, Santa Teresa, Kostaryka : Rezerwuj teraz! 50% of the total amount will be charged in case of cancellation within 7 days prior to arrival. Security Deposit of 50% from the total amount is required to confirm the booking. We live in the garden on the beach, ride waves, skate, do yoga, eat healthy, love nature, enjoy life! Being in love with this place and stoked up on traveling, we have decided to share the magic of the garden with more people and make more than a hostel in Santa Teresa. Bring your good vibes here and the garden will respond with magic energy - here it always feels like home, like a family! 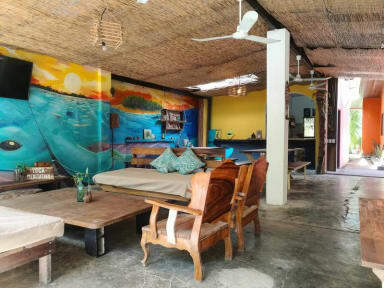 Zeneidas Surf Garden is the only hostel in Santa Teresa located on the beach. 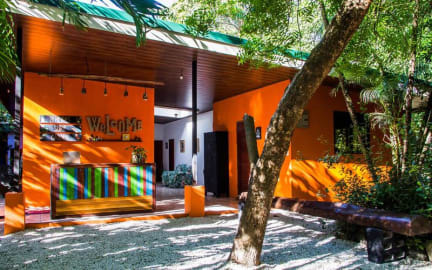 From our facilities, you can reach some of the best attractions of the area, mainly numerous beaches such as Playa Santa Teresa, Playa Cocal, Playa Carmen and Playa Hermosa. We have shared and private rooms with ACs and fans, and shared bathrooms. There are plenty of places to chill - hammocks in the garden, living area with TV, library and dining tables, two fully equipped kitchens (indoor & outdoor), fireplace on the backyard, where we make common dinners and BBQ, place for yoga & meditation. We also offer surfboards rental on site, surf lessons for all levels, yoga classes and massage. The reception is open from 07.00 to 22.00, closed from 17.00 to 18.00.